There are many benefits to buying MyM, especially for modellers who just want to write down equations and want to be able to build tool of their model by creating a graphical user interface themselves without the need of a programmer. Here is a list of eight reasons to buy MyM. Models can be developed much faster, since developers do not need to worry about implementation details or graphical routines. This makes iterative development a more viable option. MyM models are easier to maintain and debug. The full history of all variables is directly available for inspection, as are the equations and their documentation. This makes MyM models more open to inspection and much easier to analyze mathematically. Well-structured interfaces, data visualization, direct manipulation and easy access to model equations and documentation make the communication of models and their implications more effective, not only between fellow researchers during construction and validation, but also between developers and potential users. MyM provides complete freedom in the amount of detail to be shown to particular users. Interfaces are easy to adapt, both by the developers and (if desired) by end-users. MyM is developed in close collaboration with researchers of Netherlands Environmental Assessment Agency (PBL), thereby giving users control over extensions and improvements. MyM models are not interpreted, but compiled, causing simulations in MyM to run much faster than e.g. in Stella. Als you can adjust the parameters of your simulation and than see the changes visualized in realtime. 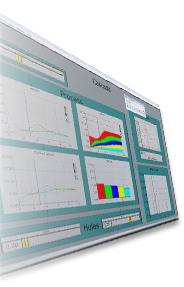 MyM provides a modeller all the tools to design, create and present a simulation model to others. By eliminating the need for external programmers and designers, the costs for development are greatly reduced. Distribution of models built with MyM are free of license fees. You can distribute your MyM model applications for free to your colleagues or customer or sell it commercially if you have a commercial license.